The NPL Queensland season is nearing the business end and teams are starting to feel the pressure. Review all the weekend's action in the Round 17 Weekly Wrap. Redlands United moved to second place on the NPL Queensland table on Friday night, overcoming the absence of three first team regulars to record a 5-1 win over Queensland Academy of Sport at Cleveland Showgrounds. Attackers Jheison Macauce and Rueben Way netted doubles for the hosts in the confidence building win against the bottom placed QAS; the result comes after last round’s disappointing 3-1 defeat to Western Pride that saw three Redlands players red-carded. Macauce opened scoring on 22 minutes when Academy failed to clear a corner, the wily Columbian tapping in from close range amidst a crowded six yard area. Way then chimed in with a quick time brace prior to half time for a three goal margin at the break – his first a well-struck shot from the top of the box after QAS failed to shut down the forward’s known threat from distance, his second a neat header from six yards to turn in Macauce’s cross neat cross. Sam Cronin pulled a goal back for Academy on the hour, the youngster curling a deft 20 yard shot past outstretched Redlands goalkeeper Mitch O’Brien for his third goal of the season. However, the hosts restored their advantage ten minutes later when Macauce flashed past the Academy defence before sliding home a neat finish. Graham Fyfe then sealed the result with a penalty in the final minutes after substitute Matt Hughes was felled in the area. Redlands now find themselves level with Brisbane City on 35 competition points but the bayside club move ahead of their northern rivals on goal difference. QAS remain mired in last spot with the result marking their 14th defeat of the season. 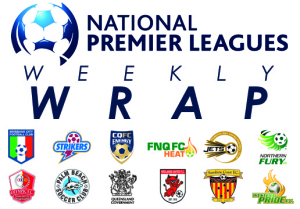 Northern Fury have moved in to the top half of the NPL Queensland table and kept their finals hopes alive following an impressive 2-1 win over Palm Beach Sharks at Mallawa Complex on Saturday evening. Robin Edwards and Michael Eisenhut scored a goal apiece as the visitors notched their third consecutive win in the south-east corner and consigned the lower table Sharks to a third straight defeat. Edwards scored his first goal since joining the club four weeks ago to put the visitors ahead on 25 minutes, the imposing forward’s well-placed header seeing the visitors take a single goal lead into half time. Following the restart Sharks levelled courtesy of an own goal, young Fury goalkeeper Matt Symes unable to prevent the ball crossing the goal line following a hectic penalty area scramble. The match seemed destined for a draw until midfielder Eisenhut popped up with his third goal in three weeks – the 29 year old New Zealander working a neat one two with Alex Read before finishing confidently from an acute angle. The result lifts Fury into sixth place on the NPL Queensland table and sets up a do-or-die fixture against fourth-placed Sunshine Coast Fire in Townsville next weekend. Western Pride put a dent in Brisbane City’s premiership aspirations on Saturday evening when the Ipswich-based club recording one of the upsets of the season to prevail 4-2 at North Ipswich Reserve. Devon Munn opened accounts from a corner in the first minute – the young defender scoring his first of the campaign from close range after beating out a host of players amidst an ungainly goal mouth scramble. Russell Woodruffe then doubled lead just prior to the half hour, the cool-headed striker pouncing on a loose ball following Robbie Livingstone’s long range free kick to net his seventh goal of the season. Soon after Woodruffe saw a strike of his own deflect off the woodwork for the lurking Will Jordan, who turned the ball home to give the hosts an improbable three goal advantage after little more than half an hour's play. Classy City striker Antonio Murray pulled one back for the visitors just prior to the interval, the always dangerous goal scorer producing a cheeky flick that caught out Pride custodian Steve Purdy. The expected second-half City comeback never materialised though, with Pride continuing to hold firm and create chances before club leading scorer Peter Drager sealed the result in the final five minutes, breaking into space and finishing assuredly for his tenth goal of the season. City substitute Jay Joo netted a late consolation for the visitors in time added on. Cty are the second big name scalp for Pride in two weeks after Kasey Wehrman’s side accounted for Redlands United 3-1 at Cleveland Showgrounds last Saturday. The loss leaves City 11 points adrift of first place and, despite holding a game in hand over their cross town rivals Olympic FC, the now third-placed club will rely on other results if they are to reel in the league leaders in the remaining five rounds. 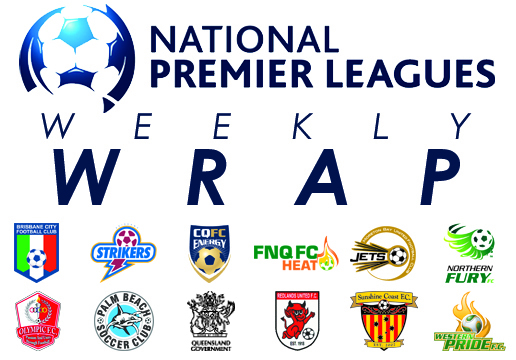 FNQ FC Heat claimed bragging rights in the final tropical derby of the NPL Queensland season in Rockhampton on Saturday night, overturning an early two goal deficit to edge out CQFC Energy 4-3 at Rugby Park. Cameron Morrison scored a second half brace to secure the points for Heat after Charlie Beverley and Simon Fernandez earlier levelled terms for the visitors after CQFC stormed to an early two goal lead. Sander Waterland and Jordan Miller gave the hosts the advantage inside the opening half hour, before a five minute spell saw both Beverley and Fernandez head home from set pieces to restore parity at the break. CQFC goalkeeper Tim English saved an early second half penalty before Morrison netted the first of his haul on 51 minutes – the 20 year old full back continuing the theme as Energy were once again unable to shut down a Heat set piece. Morrison then spectacularly secured the points, his brace and fourth goal of the season in the final five minutes with a blistering thirty yard strike. Waterland netted a final consolation for Energy in time added on, however it proved too little too late for the hosts who have now recorded 14 defeats from 17 games in their first season. The result overturns CQFC’s 4-1 win in the same fixture earlier this season and lifts FNQ FC eight points clear of Energy in 10th position on the NPL Queensland table. League leaders Olympic FC moved 11 points clear at the top of the table and edged closer to the inaugural NPL Queensland premiers title on Sunday afternoon after a 3-2 win against Sunshine Coast Fire at Sunshine Coast Stadium. Olympic captain Danny Byrne scored a brace in the come-from-behind win to cancel out goals from Fire’s Leon Dwyer and Takanori Sato. League leading marksman Tim Smits then headed home from a corner to secure the visitors the three points. Dwyer fired Sunshine Coast ahead after only six minutes, the midfielder latching onto Alex Barlow’s flicked pass before curling a spectacular 25 yard shot into the top corner of the net. Byrne scored his first of the afternoon to restore terms seven minutes later, volleying home from 15 yards following an uncleared corner; the goal awarded despite protests from Fire goalkeeper Antony Hall, who claimed he was fouled on the line from the initial corner kick. Olympic increasingly saw the best possession and field position, however Fire pulled ahead again against the run of play for an opportunistic half time lead - Zammit receiving a corner kick before finding the head of Sato at the far post for the Japanese players first goal of the season. Sato turned from hero to villain in the second half though, the defender turning over possession in his own third to initiate a swift Olympic counter attack. Captain Byrne slotting home calmly for his 16th goal of the campaign. League leading scorer Smits then secured the points for the visitors with a trademark header six minutes later – the striker turning in a pin-point corner kick from 10 yards to extend his personal tally to 22 goals this year.